Angler's Haunt - Beginner Fishing Tackle ? 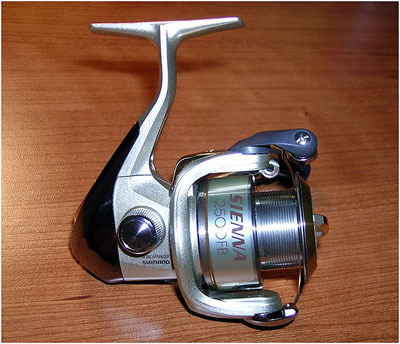 The angmos are like us – love the good reels but always use the mid priced ones. 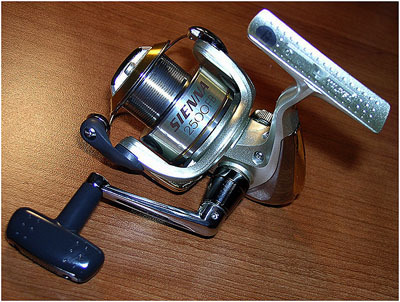 Every time I am in BassPro or Cabela’s looking at the latest model Stella, many would point at the Sienna and say ‘this is the reel you want to get’. I wonder why? After one boat trip out I realized it is too risky to bring expensive gear. The waves of the Atlantic are too scary. The wind is strong and the fish is big. Everyone had their fair share of losing their tackle to the sea. I was told to bring at least three sets of tackle for the coming big fish challenge in Rhode Island waters. Actually, Sienna is pretty popular in Singapore. Not trying to say I am cheap or people who own it is poor by calling it poor man’s Stella. I saw many anglers having no complains with it in pond fishing. For just about $50, what more can you ask. The precision and durability is not bad. 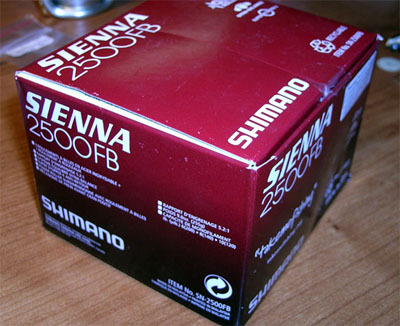 Anyway, a $1000 reel does not really catch more fishes than a $50 reel, right? Ha ha. I ordered two sets and see how the USA model compares with the SE Asia version. Actually, they are the same, all made in Malaysia. I always emphasize that a new reel should go thru some rust proofing, improved lubrication before it is committed to sea fishing. All reels are not immune to salt corrosion. Basic maintenance will make a lot of difference. 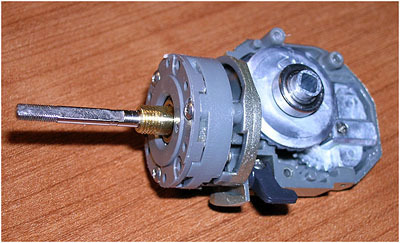 The reel stripped down and the original grease removed. 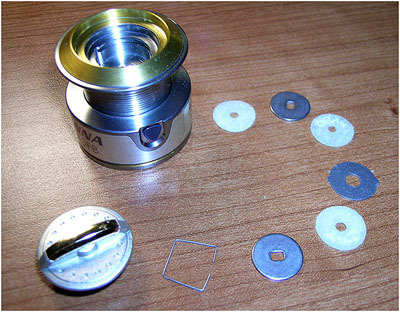 Note that I have a much better set of bearing for the gear. 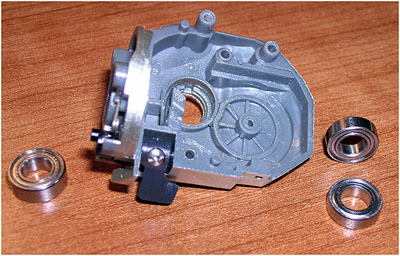 The side plate is made of hard plastic but very high rigidity. 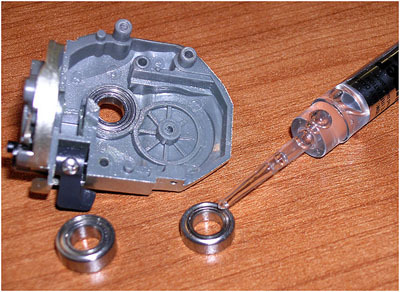 Remove the one way clutch and check for alignments. 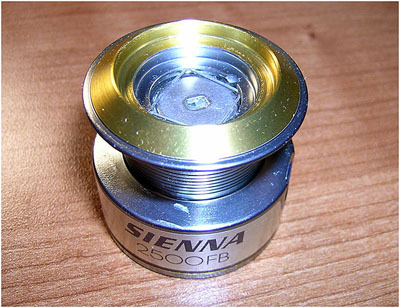 Note that the hybrid bearing has laser markings on the race. This tell the difference. 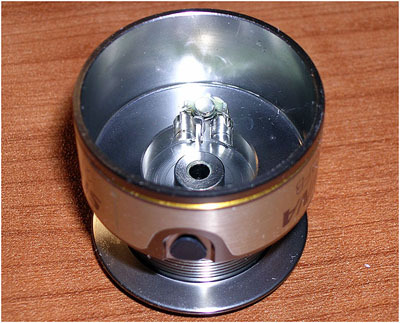 A dab of super lube light oil makes the bearing smooth and water proof. 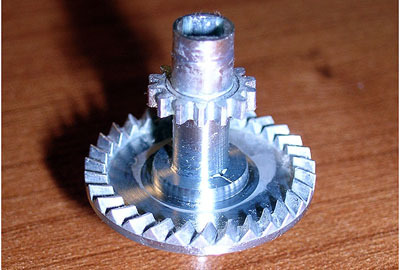 The main gear is made from forged aluminium. This gear can be pretty durable if we used better grease. The original grease is poor and becomes black pretty fast. Here is a trick how to make the reel more smooth. 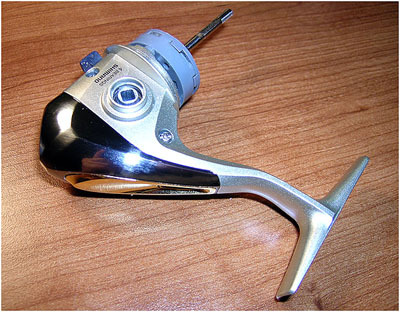 The instruction tells you to alight the two arrows on the reel and the oscillating gear. 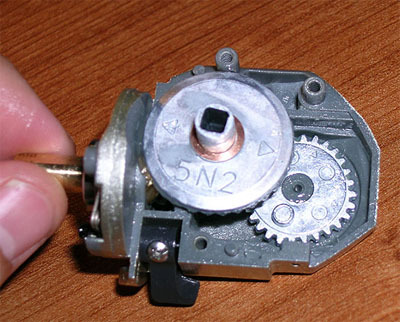 You need to rotate the brass worm gear and see if everything moves properly. You may need to lift up the main gear and advance one tooth or move the tooth down the other way. 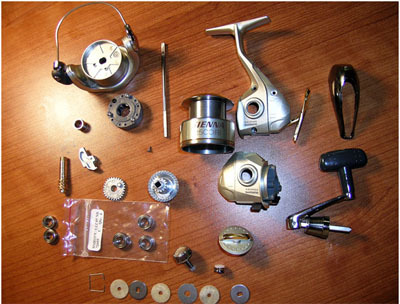 For this reel, when I dismantled from original, I realized it was not moving perfectly. 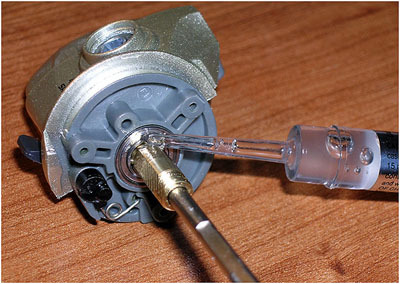 After adjustments, it can rotate in any direction with no problem. The one way clutch is cleaned and rust proof. This is a rigid frame (hybrid aluminum?) for a low cost reel. 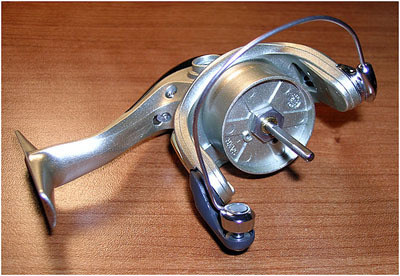 With the reel attached to the rod, it is hard to twist and bend the frame of this reel. 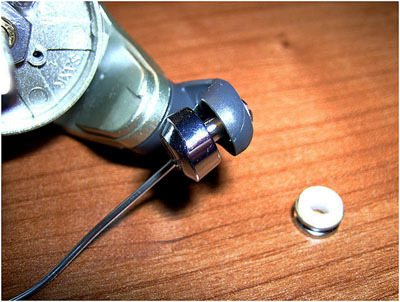 There are some Shimano reels that will bend like noodles.. The US version does not have brass lock nut. 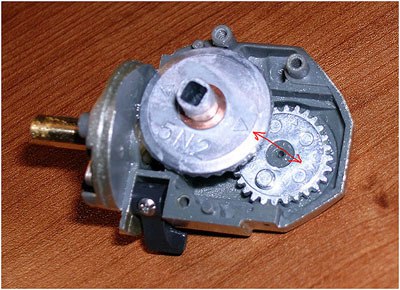 Breakdown of the knob mechanism. The handle needs more grease inside the knob. The drag is proven. Some people tweak it to have less drag, some tweak it for stronger drag. What I need here is about 15lbs of drag. The fabric is cleaned in acetone. After that, I use the thicker clear grease meant for tool cutting. Just to let the fabric drag pad soak up the grease will do. 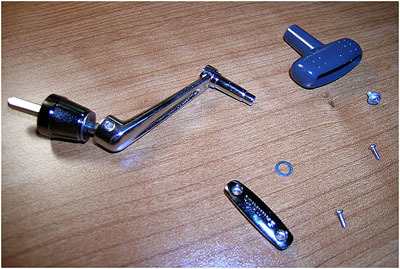 Shimano service advice is when you press the pad it should leave just some grease on your finger. Check the drag on the main shaft. The clicker on the old Alivio, Slade, etc was a night mare. This is because the clicker will break under high speed. If worried, just put a tiny dot of super glue on the bending join. 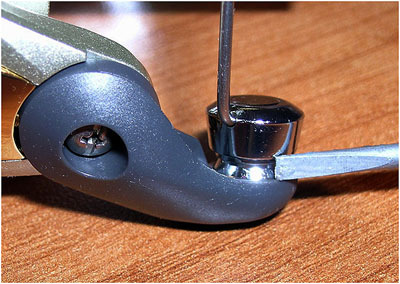 The old design bent the click into a U at right angle, causing metal fatigue and weakened the strength. The new version has a more gentle curve, so I expect the clicker to survive. 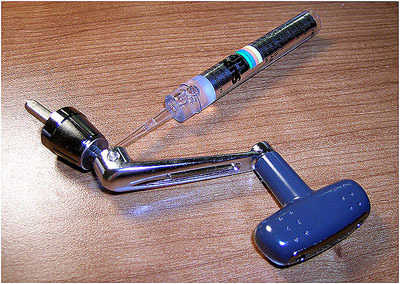 Some grease on the clicker helps. Line roller is a piece of plastic. I can put a bearing in as I have shown on Alivio. However, this size is temporarily out of stock. (And I must order 10 as minimum order here, ridiculous). Let see what the hard plastic can do. No wonder some complained this combination is a bad idea. There is no oil on the bushing too. Before a bearing is fitted, some PTFE oil on the bush.. The roller moves better down. But under load, especially high load, still would seize up. A bearing should go in eventually. Ok done. 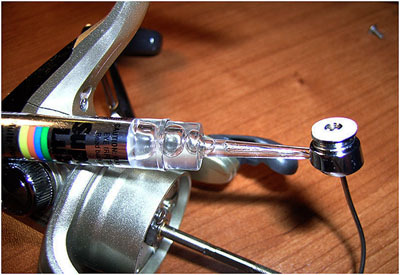 Load up with line and test the reel before actual action. Try to jerk the line out from the spool or lift some weight. Seems ok and reel is much smoother than original stater. Well, poor man's Stella it is! Not trying to say I am cheap or people who own it is poor. This write up was contributed by Jonathan aka Nimo.